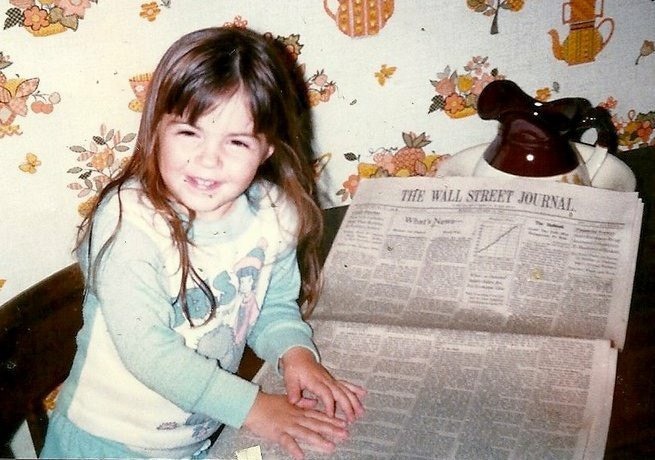 Shana with a copy of the Wall Street Journal. She says her family always knew her interests were a little different from the rest of them. Shana Sissel has survived not one, but two terrorist attacks. On September 11, 2001, Sissel was on the 64th floor of World Trade Center Tower 2. On April 15, 2013, she was three blocks away from the finish line of the Boston Marathon. Her frightening experiences, along with her childhood as the daughter of a police officer who shared his terrifying tales, have toughened her. And that toughness has given her an edge in her career — one where emotional decision making doesn’t get you very far. After receiving her bachelor’s degree in sports management, Sissel began considering a career in finance. She called her uncle for advice, and he told her to go for it. So, in May 2001 Sissel took the first step with a position at Morgan Stanley as a financial advisor. She loved it. “I loved learning about the markets, listening to the analysts, and just being part of the glamorous world of finance,” she said. On September 11, 2001, Sissel was working at Morgan Stanley at 2 World Trade Center when terrorists hijacked two planes and careened them into the Twin Towers. She says she and the other 2,500 employees owe their lives to the chief of security at Morgan Stanley, Rick Rescorla, who evacuated the building as soon as the first plane hit Tower 1, ignoring orders by the Port Authority to remain. Even as the building shook and went dark after the second plane hit, Rescorla kept the employees moving down the stairs, singing war-time battle songs to keep their spirits up. Morgan Stanley lost six employees that day. Rescorla was one of them. He went back in to the building to make sure everyone was out, and that’s when it collapsed. Sissel was shaken by the experience. For the next few months, she was in limbo while the firm figured out how to get everyone back to work. She used the time to learn about building portfolios, research stocks and mutual funds, read about the markets, and recover from the trauma of what had happened. Two years later, Sissel took another step in furthering her financial career by enrolling in an M.B.A. program at Bentley University. In 2004, she was hired at Fidelity Investments as an internal wholesaler and investment analyst. Three years later, she moved to Seattle for a position as an equity portfolio analyst with Russell Investments, and in 2008, she moved back to Boston to join Peak Financial Management as a research analyst and investment strategist. The founder of Peak later retired, and Sissel moved on to Mercer and then returned to Fidelity as a fundamental research analyst for Strategic Advisers. She was responsible for identifying investment disciplines and recommending managers to execute, and she felt like she’d come full circle in her career. Then, another terrorist attack jolted her world. On April 15, 2013, Sissel was three blocks from the finish line of the Boston Marathon when two homemade pressure cooker bombs exploded, killing three people and injuring hundreds. Sissel is also resilient. And tough. As a professional, she is unafraid to play devil’s advocate in meetings and push people to see the other side. She’s curious and always looking for more information — even when it proves her wrong, sometimes particularly so. In fact, she’s just the kind of person that CLS Chief Investment Officer Rusty Vanneman would want to work with. Vanneman and Sissel have a mentor in common: Art Lutschaunig, the founder of Fidelity Strategic Advisers. That’s what prompted Sissel to look up Vanneman after she moved to Chicago with her husband and now-three-year-old son to be closer to her husband’s family. “Art has a certain kind of person that he hires that does well,” Sissel said. “People that don’t keep their opinions to themselves and are not afraid to take risks or think outside the box. Rusty is that kind of person, and so am I.” Sissel applied for a remote position at CLS and came on board as a portfolio manager in September 2018.